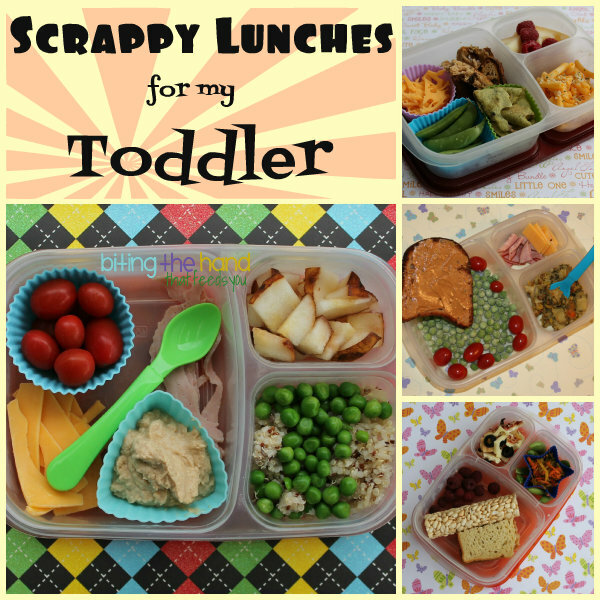 Biting The Hand That Feeds You: Scrappy Baby - No Scraps Left Behind! Scrappy Baby - No Scraps Left Behind! 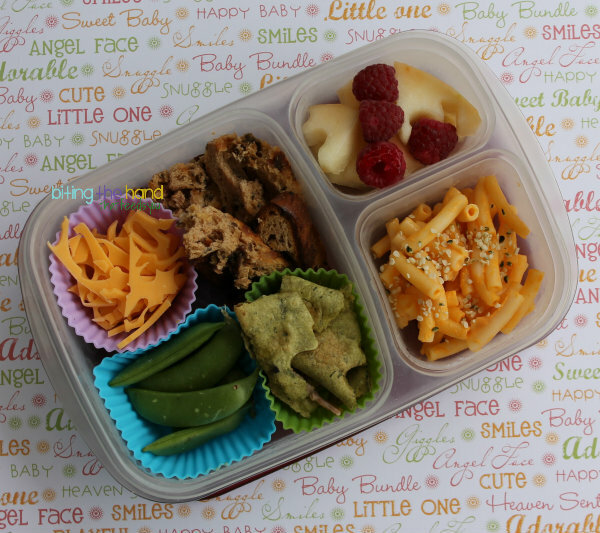 One of the first questions or objections I hear about making cute bento is what do you do with the scraps? Well, the ones I don't eat right then and there, I either feed to the kids to fend them off (if I'm making lunch with them hounding me.) Or, just like any other meal "leftovers," I save them to use later. 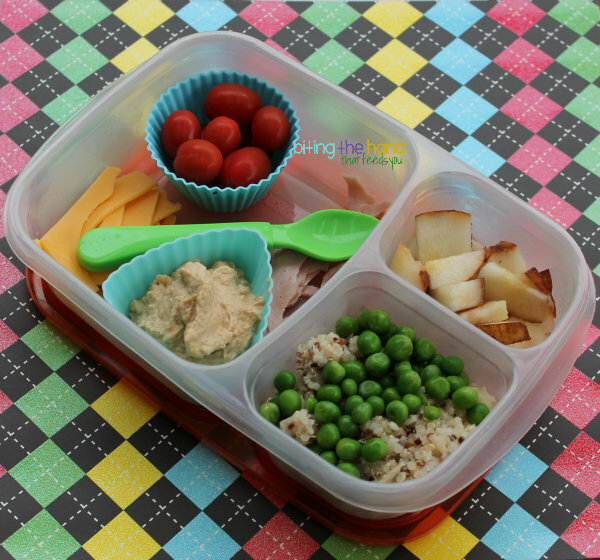 Or pack them right into Baby's lunch while I'm making Little Z's! Tuesday, 3/12/13 - The bread, melon and quesadilla scraps came from Big Sister's Leprechaun Kitty lunch, which was prepped and packed at the same time. It looks like some of the cheese scraps came from that too, and more scraps from the classroom snack cheese ducks. The quesadilla itself was made with uncured ham and cheese scraps from classroom snack cut-outs, on a Rudi's gluten-free spinach tortilla (colored with actual spinach, rather than blue and yellow dyes!) I mixed in some chopped olives to make it more appealing to Z, since she hadn't had close-faced quesadillas yet. Or ones with anything other than just cheese before either. Wednesday, 3/20/13 - These ham and cheese scraps came from Z's Cute Piggy lunch made at the same time. The pear had been half-chewed or had started going soft in one spot or something, so I salvaged what I could. The spoon is for the hummus. While she enjoys dipping things like crackers into her hummus, really it's just to lick them off and dip again. So I cut out the middle-man. I guess she could eat the rice and peas mix with it too, but she's given up on that ages ago, and just uses her fingers. 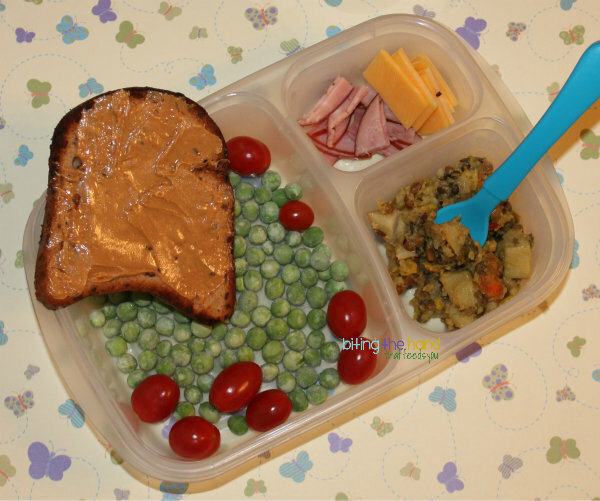 Thursday, 3/21/13 - Z had a quickie ham and cheese sandwich, but the ham slices are larger than the gluten-free bread! Plus I go ahead and cut the crusts when I can, to save them for French Toast Casserole! So the uncured ham scraps went into Baby's lunch. 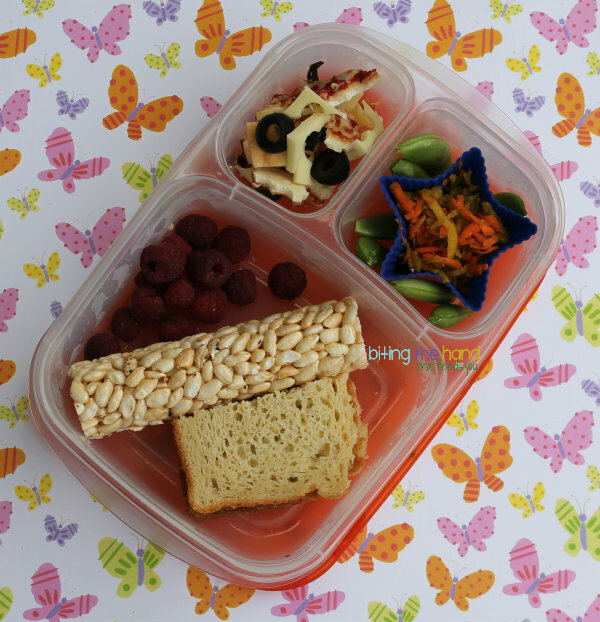 This was a "crap-I-forgot-to-pack-lunches-last-night" kind of day, so both girls got hastily-thrown-together lunches. I make a large-batch dish every week or so, where I throw in any of our organic farm share veggies that have been sitting around for a bit. I like the curry one best, so I tend to do it more often. But Hubby gets tired of it, so I do change it up once in a while. My "curry" usually has strange root vegetables (parsnip, rutabaga, sunchokes, etc,) plus potatoes and carrots, maybe some greens or celery if I have some getting wilty, plus rice and beans or lentils and/or quinoa. Several tablespoons of assorted curry powders, some salt, a few cans of coconut milk and enough water so it almost hits the top. Then I bring to a boil, turn to low, cover, and let simmer for 30-40 minutes... stirring occasionally, so the rice doesn't burn to the bottom of Hubby's "good" pot... Doh! Z doesn't like anything I make that didn't come out of a box, but Baby loves my "stewps." So sometimes I pack some in her lunch. They're messier when she throws them, so I don't include them as often. Tuesday, 3/26/13 - The pizza scraps, mozzarella scraps, and extra olives came from Big Sister's Butterfly Pizza Skewers lunch. organic raspberries, TJ's brown rice treat roll, GF PB sandwich. I'm not sure what the grated carrots are all about... it might even be a carrot and golden beet. She has a hard time with uncooked carrots, but doesn't like the cooked ones very much, unless they're mixed into soup or curry or stewp. And once they're cold she's all done. So I think I was testing to see if this was a viable option. The brown rice roll thing was a mistake. Don't get me wrong - they're really good. Kind of like a Rice Krispie treat without that cloying sweetness and over-stickiness. These are more lightly sweetened, so I can feel comfortable allowing them pretty much any time, plus they use whole grain brown rice. The only problem is that they get sticky pretty fast when exposed to moist things... like raspberries and peanut butter sandwiches, apparently. And Z complains that she can't eat hers fast enough; that it gets sticky in her hand. My solution now is to break one in half and split it between them. To eat right away though. I'd need to pack them in something air tight if it were going to get eaten later. Baby doesn't mind them sticky, but Mama minds the sticky fingers everywhere, and all the fuzzies from when she rubs it against things while she eats it. I love that she's starting to want her lunches to match her sisters! You are genius to put a couple cute shapes on top. Beautiful lunches!